A few nights ago, the Mrs. and I sat down to watch Prometheus. We had wanted to see this in the theater, but life had other plans – namely in that when it came out, we weren’t prepared to leave our infant son with a babysitter just yet. Most of the complaints I’m reading about the film deal with inconsistencies, illogical behavior, plot holes, and unanswered questions. I will freely admit that there are many of these things in the film. The film does seem to violate the principle of Chekhov’s Gun, on a number of occasions. But are these really problems? Or is something else going on here that might be worth examining? Before I delve into the ambiguities of and the complaints about the film, I want to mention a few things that caught my eye. The dome! It was nice to see the shout out to Giger’s unused design from Dune. David, attempting to formulate the Ursprache, thinking it would allow for communication with the Engineers. Overall, I found the film visually stunning, thought-provoking, entertaining, and an enjoyable 2 hours. Was the film perfect? No. Is any film perfect? Very few. While some have chosen to focus on the problematic physics of the film, and others have talked about some of the inconceivable human behavior (would you take off your helmet on an alien planet? what about microbes?? ), I want to focus on what many are considering to be plot holes and unanswered questions. Okay, fine. But let’s look at the larger picture. Polish science fiction author Stanisław Lem has written a number of works detailing the inherent problems of contact between humanity and alien forms of intelligence. His most well known work on the subject is the novel Solaris, made into a few film versions (1968, 1972, and 2002, respectively), in which the crew of a space station begin to experience strange events. Throughout the course of the book (and films), there becomes some question as to whether these events are hallucinations, or attempts at communication from the planet Solaris, which the the space station is orbiting. Is the planet alive? Is there a correlation between events on the surface of the planet (which seems to be comprised of water), and the events that may or may not be transpiring on the space station? Does one cause the other? Lem never really answers these questions. To answer them is not the point. By leaving them unanswered, we, the readers, the audience, are now forced to ponder, to think, and to discuss. This puts us experientially in the same situation as the characters in the book. The characters don’t know any more than we do. A similar set of circumstances occur in Prometheus. One complaint I’ve heard is that we don’t really have an idea of who the Engineer at the beginning of the film is, or why he does what he does. Is it an act of self-sacrifice? Is it an accident? Is it punishment for a crime? We don’t know. We can’t know. We can only see the effects that stem from the event. We can’t know, because this is an alien culture. It is entirely OTHER, even though it shares similar characteristics (physically) to our own. And, I think, this is what frustrates people. We project ourselves and what we know about ourselves onto this culture because “they sorta look like us.” We then expect them to behave with a reason and logic that is akin to ours. We expect to be able to identify with them, and understand what is going on. The film (rightly, in my opinion), forces us to confront the limits of comprehension. I’d also like to return to the idea of Ursprache, or primal language. David, the android (who also, like most androids in the Alien movies, seemed to have his own motivations), was attempting to reconstruct or deduce an original proto-language, based on human tongues. He attempted to communicate with an Engineer in this language, but was summarily ignored. An alternate cut of the scene had the Engineer responding to David, but this was cut in favor of silence. I also think this was the proper thing to do, for similar reasons to what I stated above. Just because they look like us, does not mean that we would have developed similar languages. The variety of languages here on Earth should speak to this. No pun intended. Finally, there’s some annoyance over the seeming lack of correspondence to what we know about Xenomorph life cycles, and the proto-Xenomorphs in Prometheus. 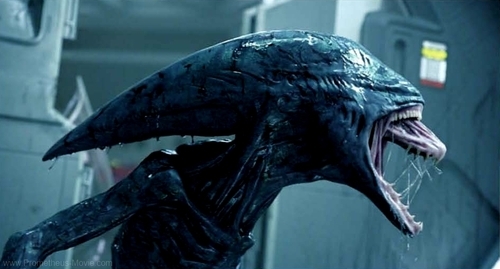 In the previous Alien movies, we have seen that the Xenomorphs are highly adaptable, and take on genetic characteristics of the various host organisms. Throughout the course of Prometheus, we see a type of face-hugger, a sort of black liquid creature, what might have become a sort of chest-burster (with tentacles!) and, eventually, what is being called the Deacon. Again, I am perfectly okay with this progression, despite its apparent inconsistency with what has previously been established. What we think we know about these creatures, comes from after the events of Prometheus, and filtered through additional host organisms. Xenomorphs evolve. If, as suggested in the film that they were being designed as a weapon, it would only make sense that they are highly (and quickly) adaptable. Alongside the film (which I enjoyed), I’ve been curious about the sheer hostility of some who are demanding Answers! Answers! Answers! Life does not contain answers. Not every single event in our lives has meaning. I don’t need to know the entire back story of my barista to enjoy the cup of coffee she has made me. Nor do I need to know whether Juan Valdez himself picked all of the beans involved, the names of the people who packed and shipped the coffee, designed the espresso machine, or ever came into contact with the particular cup I am drinking from. I do not need to understand their motivations for collaboratively forging a beverage for me. I cannot ever know everything. I’m okay with this. Lately, though, I’m noticing that when films/tv leaves unanswered questions (Donnie Darko, Lost, Inception, Fringe, etc. ), there is some kind of backlash. “You were making it up as you went along!” Or, if answers are forthcoming, they’re equally derided (see again, Lost, or Battlestar Galactica). Life has the meaning that we make of it. I don’t know if it’s the uncertainty of life in America after 9/11, where we want to know that everything has a purpose and meaning, or if this is symptomatic of a larger issue caused by the immediacy of “answers” to just about everything found on Wikipedia or Google. Is it a result of the test-score driven mentality of schools now, where students are only being taught what’s on standardized tests? Like Prometheus and the other works I’ve mentioned, life is messy. Maybe the real answers are the ones we come up with ourselves. Maybe that’s the ultimate point. Oh yeah. The bit that bothered me? Where the Engineer was, when the Deacon came out. Shoulda been on the pilot seat on his ship! Perhaps the scenario is akin to the Twilight Zone episode from the 1985 series, “A Small Talent for War”?